The endless parade of fascinating, brilliant, and fascinatingly brilliant bands emerging from Finland presents one, deeply important problem. What about the puns? Where to go with the many easy punning opportunities lined up by each of these pop nuggets? Sample quandary: does one crowbar ‘I’ve started, so I’ll Finnish,’ or ‘A race to the Finnish’ into today’s review of new noise-slicers KONEV? You may be fooled into thinking that focussing so determinedly on puns is either facile, futile, or some sort of conflation of the two (so… facitile?) – but then you’d be in the wrong place, sunshine. Puns are pretty much ANBAD’s default lazy fall-back topic raison d’etre. KONEV, a name with frankly little scope for punnage, comes from the Finnish word “kone” which means “machine”. Their music sounds like it organically mutated from bits of old machinery – the weird, Frankenstein-tinkered results of old, dusty, Eastern Bloc car parts crossed with the kind of threatening-looking weeds that grown around railway sidings. It’s the kind of beautifully swirling music that would accompany time lapse footage of vines slowly creeping up a wall and invading the crevices of a house – thin green fingers relentlessly grabbing and prying. 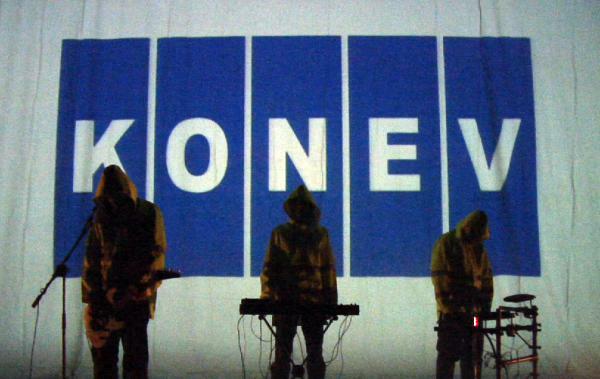 KONEV make music that bring to mind images of things that have no sound of their own – a perfectly still lake, a venus fly-trap, a cobweb. What nature started, KONEV have carefully finished. Posted on May 26, 2010 by Joe Sparrow. This entry was posted in Headline, Today's New Band and tagged not-quite-NOISE, PUNS. Bookmark the permalink.